Did you know indoor air is more toxic than outdoor air? A study published in the Science of the Total Environment reveals that the insides of our homes and office experience higher levels of toxicity; in comparison to our outdoor environment. With sources of air pollution such as fungal spores and mold present in the air that we breathe indoors, our health remains a concern. Volatile Organic Compounds (VOCs) are harmful chemicals that can be found in building and home improvement materials and household products. These are gasses that are emitted from different materials (commonly found inside your house). Being “volatile” VOCs react dangerously with nitrogen oxide and other compound present inside your body and with your surroundings and can cause health issues ranging from headaches to asthma and cancer. “Over 200 volatile organic compounds (VOCs) were identified by thermal desorption/gas chromatography/mass spectrometry in the indoor air of 26 houses,” notes the Environmental Laboratory of Helsinki in a study. Found in most nail polish removers. Benzene is found in household items such as pain, carpets and glue. This VOC is found in emissions from your stove, barbecues and burning candles. This is found in deodorizers and mothballs used for storing clothes safe from moths. Ethanol is found in a variety of household products including: detergents, dishwashers and glass cleaners. While this may be the first you’re hearing of Terpenes, they are commonly found in laundry detergents and soaps. Toluene can be found in paint. The presence of VOCs inside your home is two to five times higher than outside. “Immediately after the application of a high-VOC-emitting product, indoor levels can be more than 1,000 times higher than outdoor levels,” notes the National Resource Defense Council. Building materials such as paint, caulks, and varnishes are some of the most common sources of VOCs in your home and workplace. Looking forward to lighting up a mood candle this evening or using an air freshener to keep your home smelling nice and fresh all the time? These are just one of the many things that exposure your indoor environment to VOCs. Thinking of installing new carpets and furniture? You can be possibly bringing VOCs into your home. 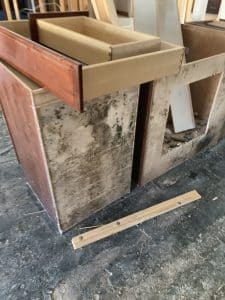 While this shouldn’t prevent you from making necessary upgrades around your home, it should help you understand the importance of paying attention to the possibility of contaminants in your surroundings. How bad can VOCs be to your health? “Many volatile organic compounds (VOCs) are classified as known or possible carcinogens, irritants, and toxicants, and VOC exposure has been associated with the onset and exacerbation of asthma,” reveals a study conducted by the School of Public Health, University of Michigan. Harmful VOCs present in the air are also associated with promoting a number of allergies, and skin, nose, eyes, and throat irritations amongst those exposed to these contaminants. Furthermore, the spread of VOCs inside a home is known as the “Sick Building Syndrome.” Referring to health conditions such as difficulty breathing, brain fog, extreme dizziness and nausea, and depression – the Sick Building Syndrome can take a serious toll on anyone’s health. Some cases of long-term exposure to VOCs include the development of chronic diseases such as cancer, heart diseases, and damage to kidney, liver, and the nervous system. How to Reduce Levels Of VOCs? Our research indicates that it can take anywhere between 2-3 months for VOCs to dissipate and even longer in homes with poor ventilation. Wondering how you can reduce levels of VOCs at home? Find out if the products that you use or store inside your home are a source of VOCs. You can do this by reading the list of ingredients listed on the items or using the help of this factsheet by the National Institute of Heath’s website. Using this information you can reduce the use of VOCs containing products in your home. For products that contain VOCs, we recommend that you keep in tightly sealed containers placed in a well-ventilated space. Improve ventilation inside your home. It is recommend that you leave windows and doors open as often as possible; to let fresh air inside your home. Maintain temperatures inside your home to remain low in both humidity and temperature. Always perform interior renovations during seasons that make it easier for you leave the windows open. VOCs, present in most indoor environments, are often not discussed when we talk about air pollutants; it is important for you to understand that these contaminants are detrimental to you and your family’s health. With the information contained in this article, we hope that you have access to the information you need to take the right steps towards maintaining a healthy environment for everyone at home and workplace.